This table shows you the strength of radiation emitted by each product. The higher the power level the greater the radiation. So a mobile phone in use on a call emits the highest level of radiation, followed closely by a cordless phone in use. 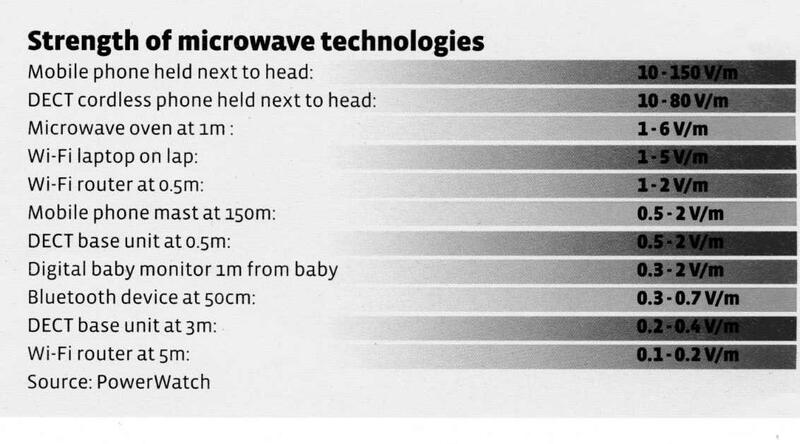 These higher levels are partly because the phone has to "power up" for a call and partly because radiation received by the body is increased by how close they are held to the body. They are especially worrying because these higher radiation levels are emitted very close to the delicate tissues of the brain, neck, face and mouth. The power levels of other technologies all seem much lower but this doesnt mean they are much safer. We are generally exposed to this radiation for much longer periods of time, so the exposure is known as "chronic". The only studies of chronic exposure are the mobile phone mast studies and they indicate a significantly increased risk of cancers and other illnesses amongst those living near to a mobile phone mast. The radiation exposure within a few metres of a cordless phone (not in use) and of a wi-fi router are equivalent to the radiaiton exposure within about 50-100m of a mobile phone mast. This isn't precise because the emissions from masts vary depending on many factors, especially the type of mast. Read more about wireless products. The higher power level of mobile and cordless phones on a call are most likely to be particularly damaging but we don't know yet how damaging is the long-term chronic exposure to the radiation constantly emitted from the mobile phone, cordless phone, wi-fi router or baby monitor when they are on standby. Many people experience symptoms from this exposure. We can’t help our children being exposed to radiation from phone masts and other people's mobile and cordless phones, but we can easily disconnect our own cordless phone and wi-fi router, at the very least at night, and we can discourage them from using mobile phones. Parents have to balance the convenience of the technology with the health risks, and everyone's circumstances are different. Some steps are easier than others and most of us take time to make these adjustments. The key message is that we can all affect our children’s future health and many of these sources of radiation are not outside our control. Parents and schools taking small steps towards reducing children’s exposure may make all the difference between them staying healthy or not.